I am your peace all day long. so that this day is full of grace. Matthew 11:28 as verse of the day. and can't wait for me to open it. He has so ministered to my heart. and you’ll recover your life. and love how The Message puts it. or we can fight against it. 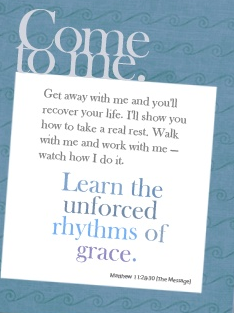 to flow with the unforced rhythms. We can get used to the push back. The push back is what we experience as stress. But He didn't come for the push back. He came that we might have abundant life. and experience a life of rest. I need to learn how Your grace works. and whatever I am doing. It's what Your abundant life is all about.